“Roxy is still missing. I will be bringing around some more posters (laminated) to post at various locations with her photo, etc. I will absolutely certainly let all social media outlets know if/when she has been found. Our other dog and Tuna the cat are doing well. Confused, but OK. Tuna doesn’t understand why he is now an indoor cat and Sophie doesn’t understand where Roxanne has gone and keeps looking. Our primary objective has been to get our daughter situated as quickly as possible so she can minimize the stress. The insurance company has rented us a house for a year and we are fortunate to have found one in Snyder Mill that suits our needs. It was actually the only thing available but we are so grateful! We will be rebuilding the house, and our target is to finish as quickly as possible although that year limit is quite unlikely to meet. We met with some architects on the site on Saturday and are confident we can move forward. The fire is still under investigation and cannot be disturbed or demolished until that is complete. We continue to ask that people notify us if someone is on the site that isn’t an official from insurance or fire investigation. Once again, dig out your fire hydrants! Don’t let them get buried in snow! Thank you again for all the support. We will hopefully be able to post some good news in the future. All in all, things could certainly have been so much worse, and we recognize that with relief. Stuff is stuff,but we are so glad our kids are safe. As you all know, there was a house fire on Woodland Drive Friday, January 27 last week. We really appreciate everyone’s concern, sweet messages and support so far. 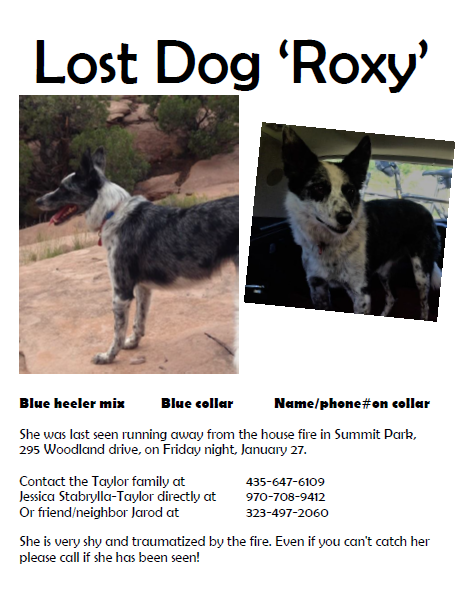 For now, if you’re interested in helping the family, please keep an eye out for Roxy (poster below) and consider donating to the family’s GoFundMe page. We will update the blog and the Facebook page as we can. “Here is our current situation. The cause of the fire is still under investigation so nothing can be removed or moved until that is complete. That is why there is no activity onsite. The burn is very unstable and dangerous and will continue to deteriorate, so people need to stay away. If neighbors see someone at the house who is not an official fire investigator they need to ask what their business is and report any suspicious activity. It could be a month before demolition can happen. One dog still missing. We are ever hopeful but very sad. We are well cared for by local friends and family for which we are grateful. We have a very responsive insurance company who is handling our meals and housing and necessities as well. We just found a house to rent today, which a major step forward. Donations of meals or clothing is just not practical right now although so appreciated as we just have no place for anything!! There is a go fund me site started, Taylor Family House Fire, Park City UT. I will update more as appropriate. The kindness of strangers has been wonderful and restorative. Make sure you dig out your fire hydrants! That is the thing that saved our garage.